Catching a movie at a place like Prasads is a bit of a problem because of all those people with cameras and mics who turn up in hordes and practically block the paths to the exit to gather the "public talk" on the film. I endeavoured to avoid them and go on my way but two guys caught me all the same and asked me if I watched the film. I did, of course. So I was led to talk about it. How was it, he asked. I replied it wasn't great. He seemed a little upset. How about Ravi Teja, he asked. Ravi Teja put in all that effort, sure, but it wasn't worth it because the movie wasn't great, I let him know. So the story isn't good, he speculated. Nope, nor are the script or the direction, I added. He was visibly uncomfortable. By this time I was getting wind of the possibility that this gentleman may be a fan of the star. In an attempt to salvage the situation, he suggested that I perhaps had high expectations. I let him know I had none at all. And I was still disappointed. That video could be my review. However, for the three reasons that a) fullhyd.com will not pay me for talking on someone else's platform, and b) I have no intention of having my readers spectate on the spectacle which is the balding forehead over my spectacles, and c) I do not have a clue of what TV/Youtube channel interviewed me, I'll get on with the review. Kartikeya (Ravi Teja) lives with his family in Pondicherry. When we say "lives with his family" we cannot do justice to the exaggeration that Tollywood is capable of when it comes to showing a guy that loves his family. He has a company where every desk, every corner, all visible space is filled with quotations of how family matters a lot (personal favourite being "Family is Devine" - in that spelling). They spend so much time with each other, drop their mobile phones in a satchel before sitting for dinner, and are all smiles all the time. Notwithstanding anything in the last paragraph, Kartikeya's family decidedly looks and feels like a professional ensemble hired to play a family. Annapurna is hired for a couple of laughs (she earns them), Sri Ranjani for the "motherly" appearance, Jayaprakash Reddy to bear the burden of the only functional emotional scene in the film, and two Telugu-speaking girls as sisters because they don't make the "glossy Greco-Roman fairness" cut like the heroines. Okay, so he loves his family. So he decides to get married for the sake of his father. So he courts Pushpa (Rashi Khanna, who has comic timing which may be exploited in a different film at a different time but not so much in Touch Chesi Chudu). And he beats up some goon who messes with his staff. And he comes across a guy whose very sight makes Kartikeya pull the revolver off a nearby cop and start shooting in public. Well, after that you have a flashback and the final show-off ...um, standoff. Final standoff. Director Vikram Sirikonda has flair - with all the unnecessary things. There are interesting shots and frames but you can't care much more for them than you care for the arbitrary girl who gets shot and killed by the villain. And when I say you can't care more, you know I'm saying you can't care less. The rest of everything is like that, too. The production values are great, but the music is just about catchy, the performances are just about functional, the jokes just about work, and the heroines just about wear clothes (yay!). All of this (except the glossy Greco-Roman fair heroines and their wonderfully short clothes) is, of course, the failure of the director-writer team in coming up with entertainment. 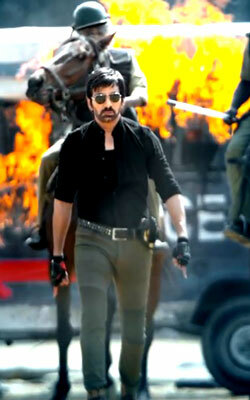 Ravi Teja brings his energy and cheer to the table. He probably should have taken a look at what the creative team brought to the table in their turn. And he probably shouldn't have touched it no matter how much they egged him on. When the teaser was released and the mass Raja yanked this guy and threw him onto another helpless guy, so effortlessly, and then walked with this swag while a few nobodys in the foreground made way for the camera... that's when I prayed for a 4 out of 10 (for the greater good) and my prayers have been answered. Thank you Josh. As usual, great review. So, another ho-hum telugu movie gets released. Should end up on TV pretty soon. fullhyd.com has 700,000+ monthly visits. Tell Hyderabad what you feel about Touch Chesi Chudu!